Is this Willenhall Goods Yard? If not where is it and can any further information be added? I have no idea of the location, but the photo seems to bear little resemblance to the track plan in British Railways Layout Plans Vol.11. I confirm that Mystery Photo no. 127 is indeed Willenhall Stafford Street station on the Midland Railway Walsall to Wolverhampton line. The photo was taken from the signal box steps looking towards Walsall. The line was double track so presumably the loco has left the rest of its train on the Up line while it was undertaking some shunting. Although Midland, the LNWR worked some of its Walsall to Wolverhampton passenger services this way. Richard is so right! The track plan in the photo does indeed correspond with that shown for Willenhall Stafford Street in British Railways Layout Plans Volume 16. I was looking at the LNWR station Willenhall Bilston Street in Volume 11. 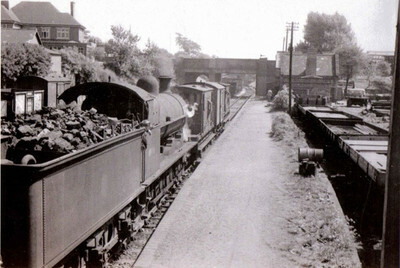 The photo is from the files of the Willenhall Historical Society and we hoped that we would get a bit of information on the locomotive itself. This is the old Market Place station at the end of Stafford Street, Willenhall. Passenger trains ceased using the line on January 5th 1931 and it closed to freight traffic on November 1st 1965. The road over the bridge is called Temple Bar and the building top left corner is the rear of the Dog and Partridge pub. The goods yard site is now a housing development called Memorial Close and the Dog and Partridge site now occupied by housing. The original photograph is in the history society archive and this should confirm absolutely that the engine is no. 49156. There is a leaflet produced by a late member of the society in 1993 about the Railways in Willenhall. As the engine number is known, the date of the photograph is probably 1950. The loco was built in 1912 as L&NWR no. 1384, and became LMS no. 9156 in 1928. Under British Railways it was renumbered 49156 (as in the photo) in the first week of August 1949, and was withdrawn from service in February 1951. I am still mystified by this photo. The location may well be as described already but what is the engine doing? Richard says it is shunting. So where are the wagons it is shunting and where is the siding or sidings it is shunting them in or out of? In front of the engine is a brake van, then a goods van and then another brake van, The photo reminds me of Plate 235 in LNWR Eight-coupled Goods Engines, where an 0-8-0 has apparently just put a brake van on the back of a train that has been assembled in a hump yard. But so far as I know there was no such yard at Willenhall. I would like to offer the following, as I lived in this area for a time. The location is right for Willenhall (Stafford Steet), but suggest the loco is no. 49106, (a Bescot loco, Walsall having closed to steam in 1958), not 49156, and that the date of the photo is round about 1960 rather than 1950 (see the BR standard mineral wagon in the extreme left of the picture). By this date the main activity on this section of the ex-Midland Rly line from Walsall to Wolverhampton was steel traffic - from Round Oak Steelworks at Brierley Hill in connection with Ductile Steelworks (Planetary Mill) & Weldless Steel Tube Ltd, located adjacent to the line in the Nechells Lane area of Willenhall/Wednesfield - plus some limited general freight, mainly steel plate & sections, to various factories in the Willenhall area (see the flat wagons on the right of the picture). Other than coal to Walsall Power Station, worked mainly from the Walsall end of the line, there was little, if any, other traffic by this period, and the line was in effect operated as a long siding. This probably explains what is going on in this picture, with the two brake vans. Only a few years later the route was severed in 1964 by the building of the M6 motorway, coal trains continuing to use the eastern 'stub' until 1980. The western end was moth-balled, reopening in 1970 from Wolverhampton for steel traffic only, trains now being worked by class 08 & 20 locos. Even this traffic ceased in 1981, and the whole line is now lifted. I can confirm that this picture is of Willenhall Market Place, the Midland Station which was closed to passengers in the 1930s. The building to the left of the picture is a pub whose bowling green backed on to the railway and from which I, as a child, watched the trains.